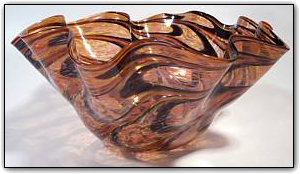 This breathtaking fluted bowl features the dynamic color combination of rich gold topaz along with deep and luxurious pinks and black. The pattern and the flutes are absolutely perfect in form, and this bowl also has real gold adventurine added for that extra gold sparkle. The more light you shine on this piece... the more it will sparkle! Make sure to zoom in to see just how deep and glorious these colors are and the way they interact with each other, the close-up pictures look fantastic and in person this bowl will simply blow you away.